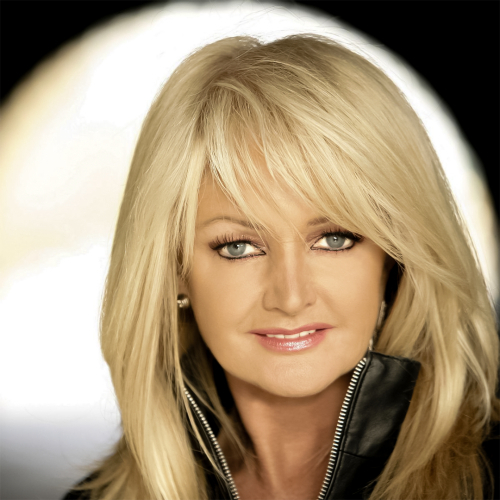 Bonnie Tyler (born Gaynor Hopkins on 8 June 1951- Skewen, Wales, United Kingdom) is a Welsh singer, songwriter and businesswoman. Beginning as a local singer in Swansea, Tyler came to prominence with the release of her 1976 album The World Starts Tonight and its singles Lost In France and More Than A Lover. Her 1978 single It's A Heartache was a hit on both sides of the Atlantic, reaching number one in several European countries and breaking the American charts. After winning the 10th World Popular Song Festival with 1979 single Sitting On The Edge Of The Ocean, Tyler converted from country music to rock music. Her career peaked in the 1980s with her Jim Steinman collaboration, releasing international hits Total Eclipse Of The Heart, Holding Out For A Hero, If You Were A Woman (And I Was A Man) and Here She Comes. Tyler’s shift from rock to soft pop in the 1990s led to further success in continental Europe with singles Bitterblue and Fools Lullaby. With German producer Dieter Bohlen, Tyler had continued success with three albums before releasing in the UK and America again, and her 1995 single Making Love (Out Of Nothing At All) narrowly missed the UK Top 40. Making a comeback in 2004, Tyler released Si demain... (Turn Around) with Kareen Antonn, which was a number one in France for ten weeks, selling over 700,000 copies. In recent years Tyler has appeared on several UK TV shows, making a cameo appearance on Hollyoaks Later, toured with Robin Gibb in 2010 and Status Quo in 2012. Her latest album Rocks & Honey (released by her own record label, Celtic Swan Recordings) has had modest success in Europe, with her latest single Believe In Me being used as the UK’s entry for the Eurovision Song Contest 2013. Following the contest, Tyler received two Eurovision Song Contest Radio Awards for Best Song and Best Singer, marking her as the first UK representative to receive the reward. With a career spanning nearly four decades, she has won three Goldene Europa awards, an Echo Award, and has been nominated for three Brit Awards and three Grammy Awards. Her distinctive husky voice as a result of an operation to remove vocal nodules has had her compared her to artists such as Rod Stewart and Kim Carnes, and in combination with her career success, has led to her being recognised as the "International First Lady of Rock", with an estimated total of 100 million records sold in her career. Early life Tyler was born in Skewen, Neath, Wales to a family that included three sisters and two brothers. Her father, Glin Hopkins, worked in a coal mine and her mother, Elsie Hopkins (an opera lover), shared her love for music with her children, and was known to have been part of the local church choir. Tyler grew up listening to Motown music and female artists like Janis Joplin and Tina Turner. She concluded her education in the sixties, leaving school with no qualifications and began working in the local grocery shop, then as a supermarket cashier. In 1970, aged 19, she entered a talent contest, singing the Mary Hopkin hit Those Were The Days, and finished in second place, winning £1. She then was chosen to sing in a band with front man Bobby Wayne, known as Bobby Wayne & The Dixies. Two years later, she formed her own band called Imagination (not related to the 1980s British dance band of the same name) and performed with them in pubs and clubs all over southern Wales. It was then that she decided to adopt the stage name of "Sherene Davis", taking the names from her niece's forename and favourite aunt's surname. Despite the two name changes, her family and friends still know her as Gaynor. On 4 July 1973, she married Robert Sullivan, a real estate agent, Swansea night club manager and Olympic judoka. In 1975, she was discovered by Roger Bell who arranged a recording contract for her with RCA Records. Before signing, she was asked to choose a different stage name and settled on Bonnie Tyler. Career 1976–81: The country albums In 1976, Tyler was spotted in "The Townsman Club" in Swansea by the songwriting and producing team of Ronnie Scott and Steve Wolfe, who became her managers, songwriters and producers. Tyler first began by recording a track entitled My! My! Honeycomb, which did not receive any chart success, but did gain local airplay in Swansea. The track was later released on the 2002 compilation, "Total Eclipse Anthology" and on a re-release of "The World Starts Tonight" in 2009, along with the rare track, Baby I Remember You. Following the Top 10 success of her 1976 song Lost In France, Tyler released her first album in 1977 entitled The World Starts Tonight. A further single from the album, More Than A Lover, made the UK Top 30. The single was banned on TV by the BBC for "unsuitable lyrical content". The follow-up single, Heaven, reached the Top 30 in Germany. In 1977, Tyler was diagnosed with nodules on her vocal cords that were so severe that she needed to undergo surgery to remove them. After the surgery, she was ordered not to speak for six weeks to aid the healing process, but she accidentally screamed out in frustration one day, causing her voice to take on a raspy quality. At first she believed that her singing career was ruined, but to her surprise her next single, It's A Heartache, made her an international star. The song reached No. 4 in the UK, No. 3 in the US, No. 2 in Germany, and topped the charts in several countries (including France and Australia). Tyler's second album, "Natural Force", was also retitled "It's a Heartache" for the U.S. market and certified Gold there. Tyler performed in the Long Miles Country Music Festival prior to the release of the new album alongside musicians such as Johnny Cash and Kris Kristofferson. In 1978, Tyler was given a Bravo Otto award in Germany for her success in Europe. Here Am I, the third single from the album (after Heaven and It's a Heartache), made the German Top 20 in spring of 1978. Tyler's next album, "Diamond Cut", was released in 1979. The singles What A Way To Treat My Heart and Too Good To Last did not chart, though My Guns Are Loaded peaked at number 3 in France and 10 in Canada. In the same year, Tyler recorded The World Is Full Of Married Men, the theme to the film of the same name. It became a minor UK Top 40 hit in the summer. Tyler's final album with CBS was "Goodbye To The Island" in 1981. The track Sitting On The Edge Of The Ocean was the Grand Prix winner of the 1979 Yamaha World Song Festival held in Tokyo. Tyler performed the song live at the festival. The track was re-recorded in Spanish, entitled "Sola A La Orilla Del Mar", and was released in Argentina and Spain. Tyler recorded Come On, Give Me Loving as a B-side to the single. In 1981, Tyler released Sayonara Tokyo, a single released only in Japan. The single did not chart.